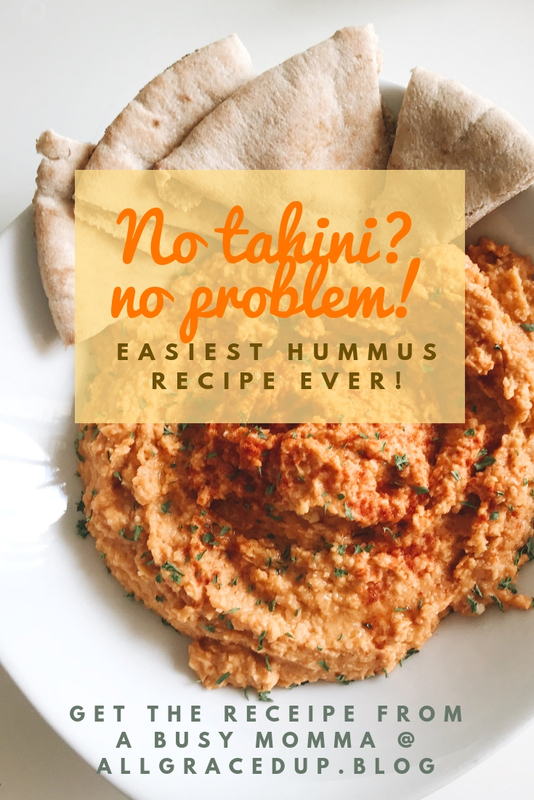 Whether or not you use this hummus recipe (helpful hint :: Pinterest has a million others), my goal is that after you leave the blog, I want you to feel inspired to try something you've always been wanting to try. I often fear things are just too time consuming or require too much thought & it held me back for so many years. FEAR. Of messing up, of not being able to finish. Lately, I've been telling myself that I haven't been given the spirit of fear, but of power, love & a sound mind. (2 Timothy 1:7) This scripture has been pushing me to start & given me the confidence that I need to finish. I didn't know until recently that food prep would fuel my fire. Besides food being a universal love language, I'm absolutely confident endorphins are produced when I'm shopping, taking photos, tasting & posting these recipes! This recipe is easy & took about 15 minutes (or less) to prepare - TOTAL! The cleanup easily took more time, ha! Ingredients & kitchen tools you'll need to prepare the hummus. Rinse beans & add to food processor, I used the 'CHOP' option. After the beans are chopped up, I added the olive oil & mixed again. Once blended, I added all of the spices (to taste) & lemon juice & mixed again. I poured into a bowl & then made a swirl with a spoon & then added some more olive oil to the top, sprinkled paprika & the parsley flakes (all for appearance). So basically, it's just blending & adding ingredients over & over again until it looks like this!! This is a super easy hummus recipe. I love making recipes my own by adding more or less spices, to taste. You can add as much cayenne pepper as you'd like to make it a more spicy hummus. You can add more paprika to make it a more roasted hummus or you can add more garlic to make it a more garlic & olive oil hummus. That's the beauty about being in the kitchen, you get to create your own unique recipes. 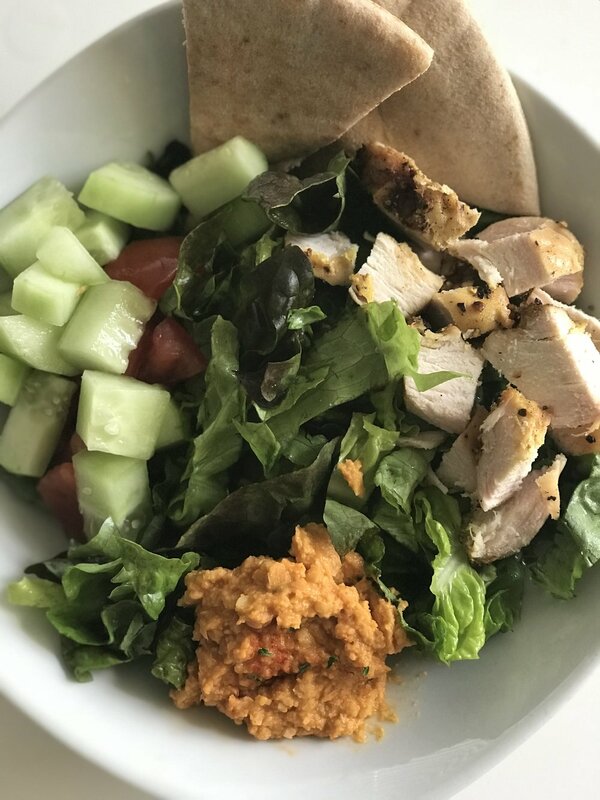 These hummus bowls are perfect for meal prep because it's healthy & has easy & inexpensive ingredients! I don't recommend prepping together with the lettuce but you can package the salad (cucumber, tomato, lettuce, etc) separately. These will probably be good in the fridge for 2-3 days. Since I already had the olive oil & spices, I just had to get the garbanzo beans & lemon so this side dish cost me roughly $1.25!! The consensus; it's much cheaper to make your own hummus. I hope you're encouraged to create & inspired to try some healthier & budget friendly recipes this week. My philosophy is to eat healthy most of the time in hopes it will make a big difference over the long run. Happy eating! Get the easiest, most tasty teriyaki recipe here! Disclaimer: Affiliate links are included in this post. If you make a purchase by clicking any of the links, it may result in a small commission to me. You can find other foodie inspired posts here. I'd love to connect with you on instagram!! Follow me here.